Successfully Added Portable Oximeter and Heart Rate Monitor with 3.5 Inch Touchscreen (2GB Free SD Card) to your Shopping Cart. Simple yet effective, this Portable Oximeter and Heart Rate monitor measures the saturated level of oxygen in your blood and your heart beat per minute by utilizing the advanced Photoplethysmograph technology. The real time readings will display on a 3.5” brilliant touchscreen at 320x240 resolution. It even has a visual trend graph to show you your heart beats, just like what you see on the monitors of those big instruments in a hospital. Better yet, results can be saved for review afterward. With the included 2GB SD card, you can save up to hundreds of thousands of results. It’s very easy to use. Just insert your finger, then press the power button and the Pulse Oximeter and Heart Rate Monitor will display your heart beat p/m, the percentage of oxygen in your blood on the screen. With a few clicks you can save current or review previous results. All this can be done comfortably at your home, without going to see a doctor. This portable Oximeter and Heart Rate Monitor is suitable for physicians, home doctors (mom), medical students, healthcare workers, pilots, community sports centers etc. It’s a must have item for anyone who perform physically active sports or high-altitude activities. Even if you don’t plan to climb the Mount Everest, you can still use one to find out your heart rate after a long hour jogging. 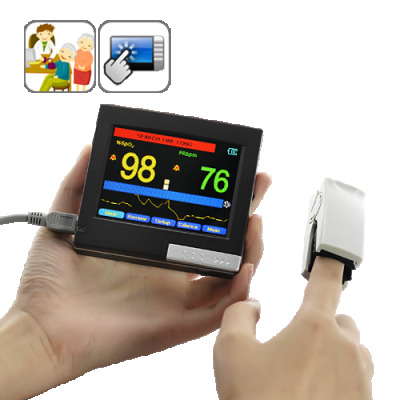 This Pulse Oximeter and Heart Rate Monitor is now in stock for immediate shipment worldwide. Click "Add to Cart" now, and we'll express ship you a sample straight away. Brought to you by your source for reliable high tech electronics, Chinavasion. Accuracy: +/- 2% for SPO2, +/- 2BPM for pulse ratio. Results can be exported to your computer for further analysis.